Can be delivered the day before no need to be up early ? Cereal â€“ Kelloggâ€™s Cornflakes 25g Paul’s Long Life Milk 150ml Berri Multi V Orange 250ml Goulburn Valley Two Fruits Diced 140g Wheelie’s Cookies 30g Serviette, Spoon & 2 sugar portions Â Minimum 20 packs per Order . Cereal â€“ Light n Tasty 35g Paul’s Long Life Milk 150ml Berri Multi V Orange 250ml Goulburn Valley Two Fruits Diced 140g Wheelie’s Cookies 30g Serviette, Spoon & 2 sugar portions Â Note. Minimum 20 packs per Order. Cereal â€“ Uncle Toby’s Sports Lift 35g Paul’s Long Life Milk 150ml Berri Multi V Orange 250ml Goulburn Valley Two Fruits Diced 140g Wheelie’s Cookies 30g Serviette, Spoon & 2 sugar Note. Minimum 20 packs per Order. Bacon, sausages, eggs Â any style, roma tomatoes, toast, butter & jam. Breakfasts are available as, buffet with staffÂ or drop off. Wide spatula: Burgers, chicken pieces, steaks, and veggies take a turn for the better with a wide metal spatula. Grill Tongs: For turning sausages and franks, but also scallops, prawns, tortillas/pitas. Meat fork: For lifting large roasts and whole birds once they’re done cooking. Also helps with carving. Grill brush: Brass bristles resist rust and won’t scratch porcelain enamel. Steel brushes are better for cast-iron grates. Basting brush: We recommend natural bristles (nylon bristles will melt if they touch the cooking grate) and a long handle. Always wear a mitt when basting, in case of flare-ups. Barbecue mitts: Long-sleeve, flame-resistant mitts protect your hands and forearms. Use two when lifting roasts. Meat thermometer: Invest in a quality one. Most are a probe you can stick into the centre of the meat for a quick read and cannot be left in the meat. Others can be left in – the probe is attached to a wire that runs outside the grill. These usually have an alarm that sounds when the food reaches the desired temperature. Spray bottle: A spray bottle full of water is handy to keep around in case of small flare-ups while you are cooking. Use water sparingly to avoid steaming your food or putting out the fire. A super wide spatula designed for turning whole fish. Skewers make turning small foods quick and easy. Soak wooden/bamboo ones for 30 minutes before threading them. A vegetable wok/grill topper makes grilling small and delicate vegetables easy. Wash tools with hardwood handles by hand to preserve wood finish. Wash natural-bristle basting brushes by hand. Use plenty of hot, soapy water to wash oils out and rinse well. Smooth the bristles and air-dry completely. Having a meeting? Small and quick corporate function? Small private function? 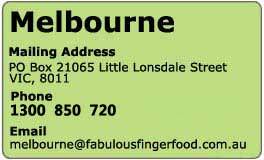 Fabulous Fingerfood provides corporate and private functions with delivered hot fingerfood! For those small functions where you want something simple, but yet tasty and hot, and yet don’t have the facilities. Experience has shown us that some items dont travel very well whilst retaining their heat, so we will guide you into the correct menu to best suit your needs. Your order will arrive at the time requested, piping hot, ready to serve, in a polystyrene box with foil wrapped over the products to retain the heat. Added to price of the actual food. Price of the food will be quoted as a customized menu. 10am â€“2pm Monday to Saturday.Out DIY packs come with full instructions.Or hire our Party Hands to do it all for you. 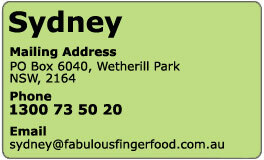 Mr Fingerfood are finger food and cocktail party caterers providing catering services in both Sydney and Melbourne. Looking For A Catering Company In Your Area Of Sydney? All Suburbs Catering serves all areas of Sydney, including yours! We cover the entire metropolitan area – phones answered 24 hours a day. If you require any further information or help organising your function please do not hesitate to contact us on our Free Call 1300 368 251. Don’t live in Sydney? No worries – we service the NSW South Coast from Wollongong to Nowra and the NSW Central Coast. For these areas you can make your bookings on Free Call 1800 354 755. Here’s a complete list of our service areas – if you can’t see your suburb listed below, please contact us. You are currently browsing the Sydney Catering - Finger food & Spit roast News, views and reviews blog archives for April, 2008.